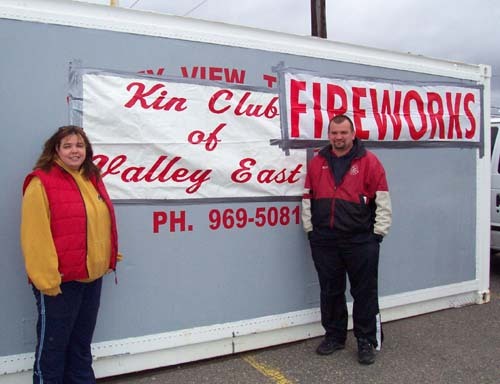 "Keeping The Spirit Alive" in Valley East is one of the definite outcomes that this town can use when the Lions of Valley East host their First Annual Charity Days on September 8 and 9. 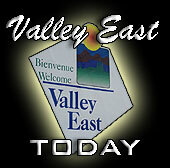 The Annual General Meeting of the Shooting Star Day Care / Gardenia Etoile Filante will be held on May 29, 2006 at 6:00 p.m. at the Valley East Public Library. Linette Filippini, President of the Board of Directors, shown in the photo on the far right, is hoping for a large turn-out of parents for this important event. 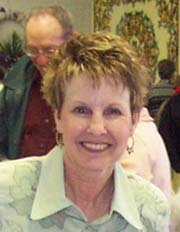 The Shooting Star Day Care, which opened its doors in 1998, has over 200 registered children attending its programs. 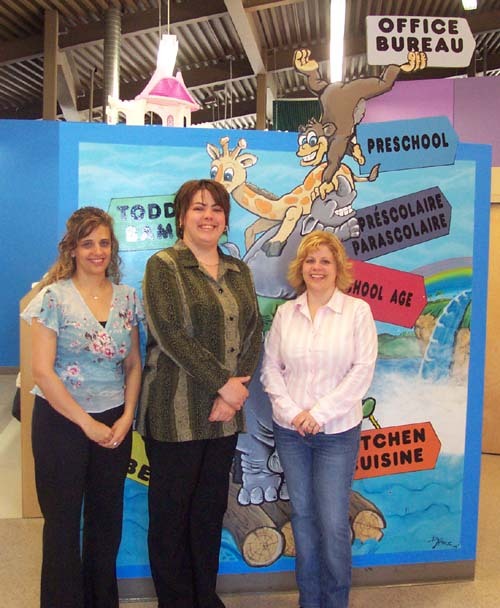 Others in the photo include, Michelle Wiebes, Supervisor of Program Development and Implementation on the far left; and Chantal Boucher, Executive Director in charge of the overall Day Care Centre. On Monday, May 29, 2006 , the students at Ecole Publique Foyer-Jeunesse in Hanmer will be treated to a once in a lifetime event. 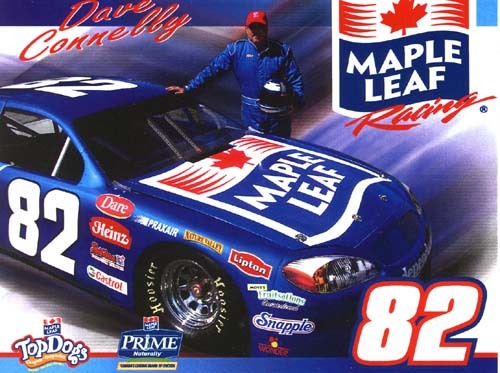 The Maple Leaf Race Team will be on hand with their 500 H.). Maple Leaf Cascar Super Series stockcar which competes at events throughout Canada , including the Montreal Molson Indy Race. Students will be able to hop in, check it out and get an autographed picture from driver Dave Connolley. A free BBQ lunch will be provided to all of the students and staff. Volunteers from Foyer-Jeunesse, Neil’s YIG and the Maple Leaf Race team will be helping to cook. Later that afternoon, the Maple Leaf Race Team will be at Neil’s Your Independent Grocer Store from 3 p.m. to 7 p.m. to host a fundraising BBQ with 50% of the proceeds going towards Ecole Publique Foyer-Jeunesse and 50% going to the President’s Choice Children’s Charity to assist physically and developmentally challenged children in the area. On behalf of all of the members of the CENTRE CLUB AGE D'OR DE LA VALEE, I would like to express my sincere appreciation to the entire community for their support of the TEA & BAZAAR which was held on April 23, 2006. I want to thank all of the people who volunteered their time in any way to help out. A big thank you goes out to Mike Biglow of J.B. Jewellers for donating a beautiful picture valued at $500 which was won by Mr. Donald Lavigne. En mon nom personel ainsi que tous les membres de notre CENTRE CLUB AGE D'OR DE LA VALEE, nous vous remercions encore une fois pour nous avoir supporte lors de notre THE BAZAR DU 23 AVRIL. Merci a tous ceux et celles qui ont travaille pour le succes de notre THE. Grand merci a Mike Biglow de J.B. Jewellers pour le don d'un beau cadre d'une valeur de $500.00 dont le gagnant fut M. Donald Lavigne. It has often been said that a person’s life is the sum total of his/her experiences. On the surface that seems like a simple enough statement, but if one accepts this premise, then why do so many of us engage in practices and activities which are negative and actually hurt us. Consider the family of five who decided one day to each clean a different area of the home. They each took a sponge, did the cleaning, and then placed the sponges back on the kitchen counter top. The sponges all looked the same. Later that day a visitor came along who was curious as to what was cleaned in the home, but couldn’t tell by looking since the sponges all looked the same. So, in order to satisfy his curiosity, he decided to squeeze each sponge to see what came out. When the first sponge was squeezed, some cola came out, so the visitor decided that someone cleaned the kitchen with that one. Upon squeezing the second sponge, he found tub and tile cleaner and concluded that this sponge was used to clean the bathtub. The third sponge produced motor oil when squeezed, so obviously, someone was cleaning the garage. In the fourth sponge, baby powder came puffing out when it was squeezed, which meant that the baby’s nursery was done with that one. And finally, in the last one was floor wax, which was used on the hall floor. As the visitor lay the last sponge down, he again remarked at their similarity. Once again he pointed out that they all look the same until they’re squeezed. It is only when they are squeezed that you can find out where they’ve been and what is inside of them. As we encounter the wide variety of events in our journey through life, we too are squeezed, just like the sponge and different things come out. Some people get angry; some seek revenge; some shed tears; some laugh; some look upon life as wonderful; others have a negative view of everything; some show their love for one another; others think only of themselves. The main lesson here is that as individuals we must all remember that we are no different from a sponge. We can only squeeze out what is put in. As babies, we are born into this world empty. We are like a new sponge. As we go through life, our ‘sponge’ is filled with things that we absorb through experience. If we look for the good in others and try to carry a positive attitude around with us wherever we go, then as life squeezes us we will have a better chance of coping. If we are constantly finding fault with others and forever look for excuses for our behaviour, when life squeezes us we may not like what comes out. This is a lesson to which all young parents should pay particular attention. The experiences your children have while they are growing up will determine how they respond to challenges as adults. Children are like sponges, taking in everything you provide. If you instil positive family values in a child from the time he/she is born, then those values will form part of the child’s personality later on in life. If you show your child how to love, he/she has a better chance of being a loving person. If you demonstrate that you respect all forms of life, so too will your children. However, if you are disrespectful of authority; show that you don’t care about the quality of your work; and disregard the rights of others, don’t expect your children to be any different. When you line people up side by side, they all look similar. Just as it is with the sponges on the kitchen counter, you don’t know where they’ve been until you squeeze them. Once squeezed, the secret is out, and you can rest assured that on the journey of life we will all be squeezed many times. All we can do is make sure that what we put into our life is what we want to come out whenever we are squeezed. The Co-op Education Program is one of the best things that ever happened to the Ontario Education System. Students who enrol in the program have an opportunity to work for half a day in a real-life business setting while earning two credits towards their secondary school diploma. More importantly, these students get practical, hands-on experience which will help them decide on an appropriate career choice. 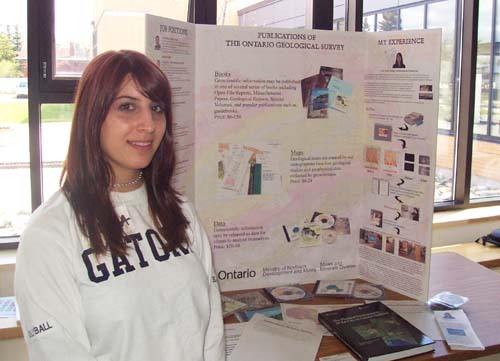 The Co-op Education Class at BAC contained thirteen students during the second term of the 2005-2006 school year. They put on an exhibition for the rest of the school to explain details of their co-op experience. Cera Scarr, a Grade 12 student at BAC, is completing her coop placement with the Publications Services Section of the Ontario Geological Survey at the Ministry of Northern Development and Mines building on Ramsey Lake Road. She will spend approximately 220 hours working on a variety of projects. "I feel that a Co-op placement working in a section of a government ministry which is responsible for the Ministry's marketing and information will help me in my career choice," explained Cera. 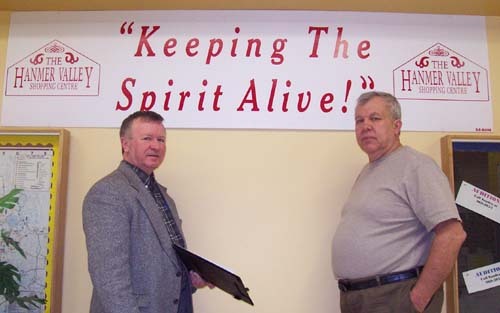 "As a result, I have enrolled in the Public Relations program at Cambrian College in Sudbury. I will be able to utilize the skills I am learning in the future since Public Relations is about communication and the transferring of information. Therefore the placement is directly related to public relations and promoting of information." 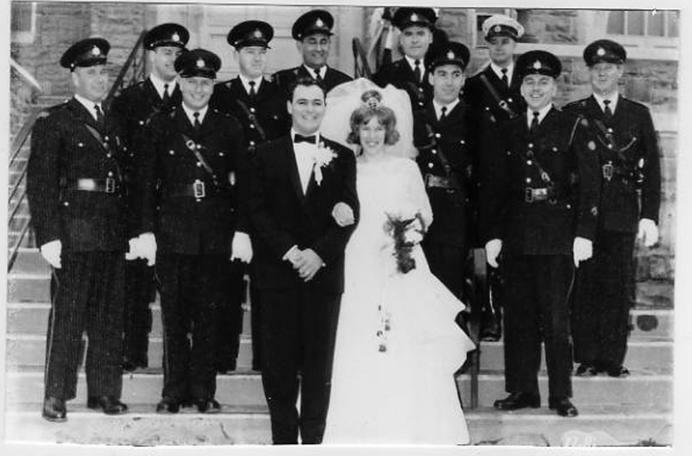 The photo to the left was taken on May 9, 1964 upon the occasion of the marriage of Joe Niceforo to Jean Pharand. 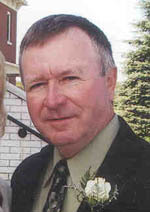 The wedding took place at St. Jean de Brebeuf on Notre Dame Street in Sudbury. The people in the photo on the left were having a great time engaged in friendly conversation at the Hanmer Valley Shopping Centre table where members of the Grotto Association were selling raffle tickets on some wonderful Mothers' Day prizes. 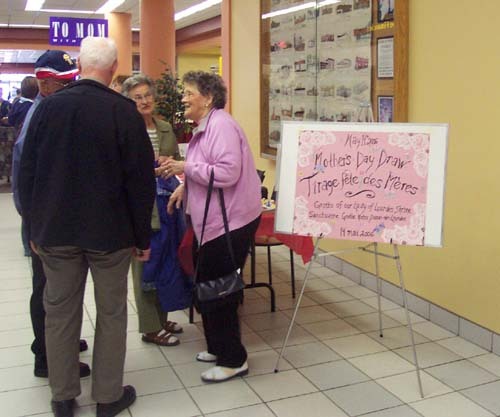 Congratulations also to all six early bird draw winners of $100, held from November 2005 to April 2006. There were Betty Kennedy (November), Delores Corriveau (December), Jackie Mathias (January), Hortense Quesnel (February), Mary Ann Arsenault (March), and John Bishop (April). Our Lady of Lourdes Shrine is at 271 Van Horne Street in Sudbury. For more information call 675-5712.